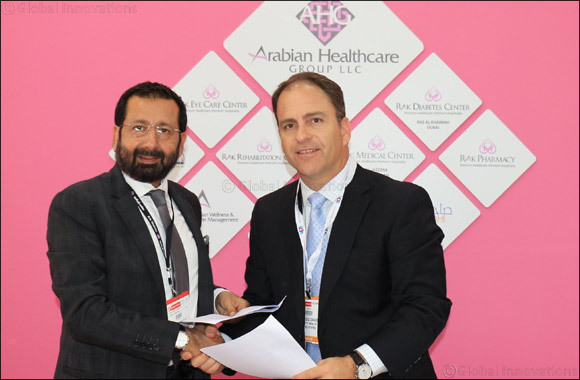 March 8th, 2018; Ras Al Khaimah, UAE: Continuing its efforts to bring world-class expertise and clinical care to the doorstep of UAE residents, Ras Al Khaimah (RAK) based Arabian Healthcare Group has formed a strategic alliance with Dignity Health, one of the largest healthcare providers based in the United States.Through this collaboration, the Arabian Healthcare Group and its subsidiaries that include flagship RAK Hospital, RAK Medical Centers, RAK Diabetes Centers and several other entities, will provide more advanced medical services in the area of orthopedics, rehabilitation, oncology, neuroscience, cardiology and thoracic medical care, for patients within the UAE and surrounding countries. “We have identified three main areas for the collaboration including clinical excellence, education, and digital innovation. The idea is to expand medical services to improve clinical outcomes and the patient experience,” said Dr. Raza Siddiqui, CEO, Arabian Healthcare Group. The use of telemedicine is a key component for the alliance and will dramatically change the UAE healthcare landscape. It will include second opinion programs, consultations, virtual tumor boards, and patient e-visits, among other capabilities. Arabian Healthcare Group physicians will collaborate directly with Dignity's clinical experts to validate diagnosis and treatment plans that will enable patients to receive the best level of affordable care. “Connecting our physicians in UAE with Dignity Health's global network of 9,000 physicians will ensure patients receive the best treatment. Dignity Health will leverage their digital services and other technological platforms to give patients in the UAE the information they need to make better decisions about their medical care”, added Dr. Siddiqui. The Dignity Health Telehealth network integrates expert physicians with state-of-the-art technology to connect patients to life-saving medical care. These digital capabilities will also give patients who live outside of urban care centers access to clinical experts familiar with the latest care and treatment options. “We are truly excited to collaborate with Arabian Healthcare Group in the UAE and to be able to provide our global expertise to the people in this region through this partnership. Our mission and values are aligned to provide patient-centric care, which is the cornerstone of our alliance. Our goal is to establish a long-term, sustainable partnership that will support global healthcare innovations and provide patients access to high quality care wherever they are,” said Gregg Davis, Chief Administrative Officer, Dignity Health International. The mission of Dignity Health International is to develop and share best practices, support clinical education for the healthcare workforce and improve quality outcomes. Educational services will include a spectrum of support for executive leadership, clinical and non-clinical training for physicians, nurses, and other support services such as rehabilitation therapists and case managers.